This is the fourth in a series of reports by the Loughborough University Communication Research Centre on national news reporting of the 2015 UK General Election. Top 20 politicians in coverage. Top issues over the last week. The impact of televised leadership events on other news coverage. Negative press treatment of Miliband and Labour is intensifying as the campaign enters its final stages. The televised leadership events in this campaign have attracted less than half the levels of commentary found for the leadership debates in the 2010 General Election. 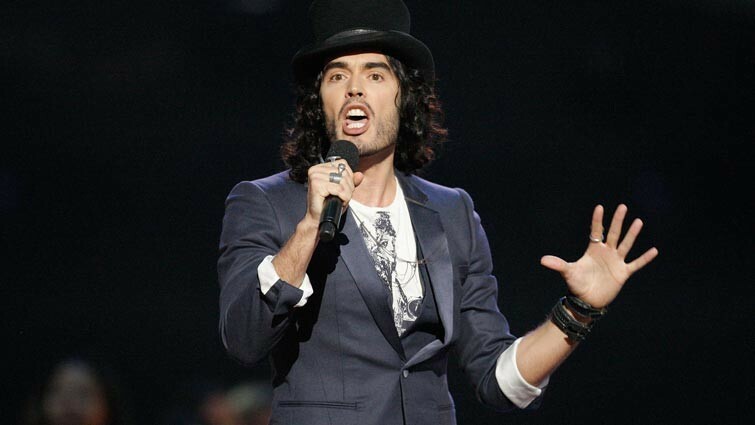 Russell Brand makes it into the top 20 most reported political figures. Economy and Taxation continue to dominate the election agenda. On TV news, both main parties appear roughly the same amount of time on TV news but the Conservatives speak for longer. 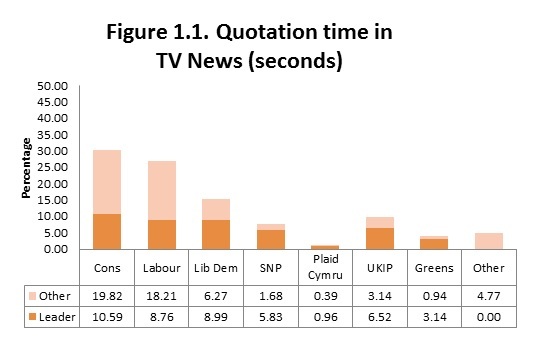 Figures 1.1 and 1.2 show that a ‘quotation gap’ is still evident in TV news coverage, favouring the Conservatives, but Table 1.1 shows there is no ‘appearance gap’ in TV news coverage. The Conservatives appear more often in the press and are quoted more often. The data reveals a large ‘quotation gap’ and an ‘appearance gap’ in press coverage favouring the Conservatives. The ‘quotation gap’ is growing to the Conservatives advantage in the press, from 12.93% last week to 14.92% this week but has continued to shrink on TV from 4.2% up to 22 April to 3.4% up to 29 April. For the minor parties the leaders continue to be the main (if not only) actor to regularly appear and speak in the news on both press and TV. UKIP is sustaining its presence on the TV news and press coverage. 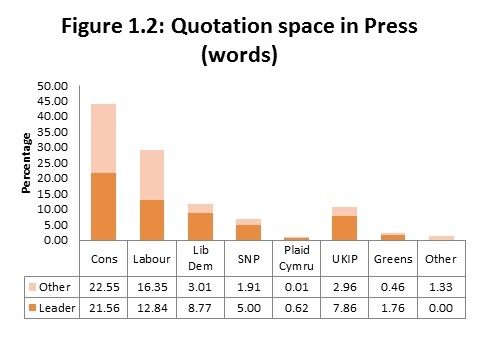 UKIP is level with Lib Dems in terms of quotation in press but not TV coverage. There was little change from last week in the quotation time and appearance of the Greens, Plaid Cyrmu, and the SNP. We have also continued to monitor the ‘direction’ of coverage. Figure 2.1 extends the measure we provided last week, giving an indication of average positivity/ negativity of party coverage across the four sample periods. An increase in positive rankings for the Conservative party over the latest sample period. Increased levels of negativity for Labour-related coverage in the latest part of the analysis. A recent increase in the negativity of SNP coverage. UKIP has secured a positive aggregate profile for the first time, albeit highly marginal. In the above measure, all rated articles are treated as equal. But, of course, newspapers have very different circulations. For example, in March 2015 the Sun sold 1.858 million copies a day, whereas the Independent sold around 58,000. After a helpful suggestion from one of our twitter followers, this week we have weighted instances of positive/ negative coverage by circulation. For example, a positively ranked article in the Sun was scored as 1 x 1.858, whereas a positive Independent ranking was scored as 1 x 0.058. When these weightings are factored in, a different perspective starts to emerge about directional imbalances in press coverage (see Figure 2.2). The strong positive media rankings for the SNP in the first sample period were mainly located in the ‘quality’ newspapers with lower circulation. As a result, SNP rankings overall were only marginally positive by this measure. On the other hand, the negative rankings for the SNP in periods 2-4 were not as dramatic as those suggested by Figure 2.1. This again reveals that a lot of this negatively inclined coverage was focused in the quality press. 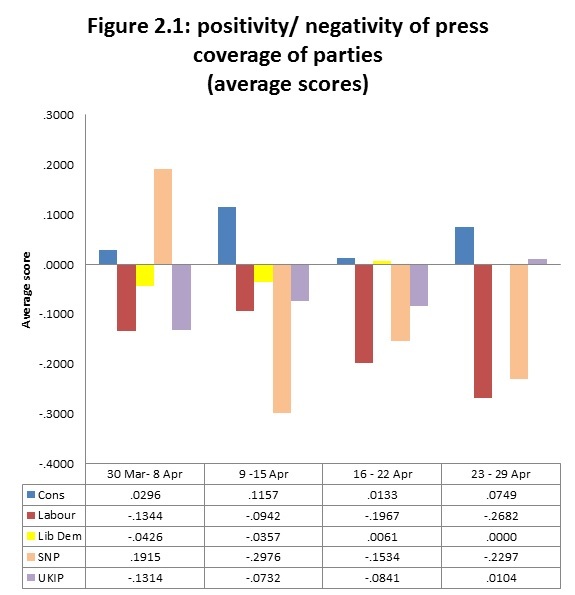 The negative coverage of the Labour party has increased week-on-week and considerably exceeds the negativity found in SNP and UKIP coverage. This reveals a high proportion of negative coverage of Labour among the most popular newspapers. In contrast, the Conservative party has had uniquely positive cumulative treatment in the national press, particularly the more popular titles. Moreover, this positive pattern is more consistent and considerable than is suggested by Figure 2.1. UKIP treatment remains consistently in debit, but less clearly so than in Figure 2.1. 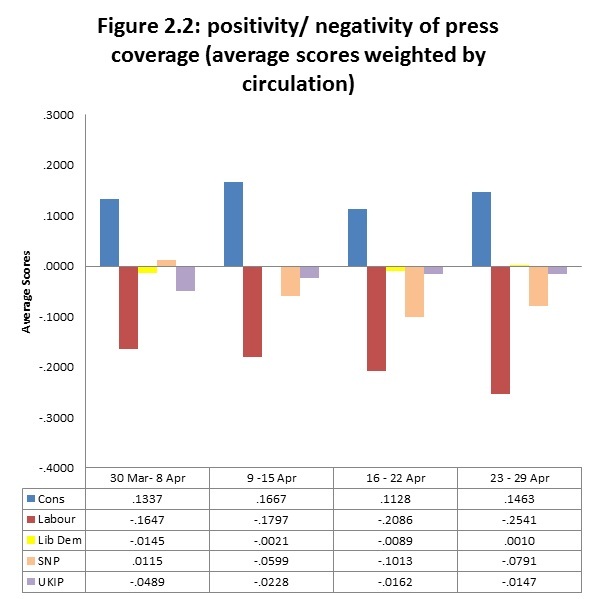 This may reflect that most levels of negatively orientated coverage is located in the quality press, but could also signify the impact of Daily Express and Daily Star coverage. As was noted in our previous report, both papers have been uniquely positive in their coverage of this challenger party. David Cameron regained the top place from Ed Miliband but the latter has closed the gap to a near dead heat as the campaign enters its final stages and the news media focus on the principal contenders for the premiership. Both leaders enjoy a significant lead over the next placed contender, the SNP’s Nicola Sturgeon who continues to receive considerable attention for both her performance and her party’s potentially crucial role in deciding the fate of Cameron and Miliband. Elsewhere the rankings are relatively stable with several political figures retaining the same position for the second week running and others experiencing only modest movements up and down the list. Foremost here are the respective leaders of the parties- LibDem and UKIP- currently vying to be third largest in terms of vote share. Natalie Bennett retains the same place as last week although her Plaid Cymru counterpart Leanne Wood disappears from the list in what has been another disappointing period for female politicians, particularly from the major two parties. Returning to the chart regulars, Nicola Sturgeon and Natalie Bennett are exceptions in a top ten dominated by men including George Osborne and Ed Balls reflecting the centrality of the economics debate. The prominence of Boris Johnson and Alex Salmond is more a signal of their value as ‘characters’ on the campaign trail than spokespeople for their respective parties. Other male politicians chart because of the Scottish debate. Making the listings this week are Samantha Cameron and Miriam Gonzalez Durantez with Justine Miliband just falling slightly behind. Once again, they have achieved greater prominence than most of the leading female politicians of whatever party. Coverage of the ‘horse race’ itself still dominates the news but has decreased this week by around 8%. That said, its volume is still striking when compared to substantive campaign issues. Turning to these, the following patterns are evident. Interest in constitutional issues has continued to grow, driven in no small way by opinion polls predicting a SNP landslide in Scotland and speculation about what this might mean for post-election relations between the SNP and Labour. Also up this week is news about business, housing and taxation. Holding steady is coverage of the economy, which remains the leading substantive issue in the news. In addition, coverage of employment, race/Immigration/Minorities/Religion, standards/Corruption/Scandals/Sleaze, defence and the military and social security are also almost unchanged. NHS has fallen steadily as an issue over the campaign and is now outside the top ten leading issues for the first time – bad news for Labour who could be said to own the issue. It could be said that their attempt to ‘weaponize’ the has resulted in the production of a water-pistol. There are several issues which we might have expected to feature more prominently in the campaign but have so far been largely invisible. Key amongst these is Education, which although it has increased this week has attracted relatively little attention given its importance – possibly bad news for the Liberal Democrats who have made it one of their major campaign issues. The environment has also failed to gather any momentum as an issue despite the increased presence of the Greens on the electoral stage. With the exclusion of so-called ‘meta-coverage’, the week’s campaign agenda has been dominated by the economy, taxation, and business, issues which the Conservatives are seen to have advantage over Labour and the other parties in terms of public opinion. The steady disappearance of the NHS from the agenda is also bad news for Labour. The NHS has not featured in the latter part of the campaign as Labour would have wanted. Finally, the relative absence of news on Europe, and to a lesser extent immigration, at this stage of the campaign could be seen as bad news for UKIP who have campaigned hard on these issues. As we move into the last week of the election campaign it appears that the media campaign at least is being fought primarily on Conservative terrain and that Conservative-supporting national newspapers are key agents in this process. There was considerable controversy prior to this election as to whether there would be a repeat of the televised leadership debates first held in the 2010 Election. In explaining his opposition to any repeat, David Cameron stated his view that the televised debates ‘sucked the life’ of the previous campaign. Whether or not that was the case, the leadership debates generated considerable editorial excitement and media commentary. Our previous research of the reporting of the 2010 election found that nearly 1 in 4 election items made some reference to these televised events. 30 April: 1.5 hour Question Time Election Leaders Special featuring, on a one by one basis, David Cameron (Conservative), Ed Miliband (Labour) and Nick Clegg (Liberal Democrat). The complexity of formats and participation contrasts with the straightforward arrangements in 2010, which saw three, tri-partite debates between the leaders of the three major parties, addressing respectively, domestic affairs, international affairs and economic affairs. Table 5.1 compares the amount of coverage these televised leadership events have stimulated so far in the 2015 campaign, with levels found in the 2010 election. (NB. To enhance comparability, we have matched the the 2010 sample to the time span available for the 2015 analysis [i.e. up to the eve of the last televised events for both campaigns [29 April 2010 and 30 April 2015]). The findings show that the 2015 televised leadership events have so far attracted far lower levels of media commentary and coverage than their 2010 equivalents. Whether this marginalisation has had a restorative impact on the range and quality of debate in this general election is a matter for further consideration and discussion. But there is clear evidence that the greater complexity and inclusivity of the 2015 televised events has, so far, compromised their news value considerably. The LCRC draws on the experience of its members who are leading international media and political analysts who have published widely in the fields of communication research and methodology. The LCRC has no links with any political parties or interest groups, nor has it conducted research or consultancy on behalf of organisations that could be categorised in these terms.